Our Student Driver Signs are printed using screen process printing sometimes called "silk screen." We use the highest quality exterior screen ink. 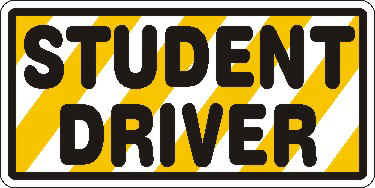 Student Driver signs are available in many sizes and materials. All signs have rounded corners to promote durability with frequent removal from the vehicle. The higher the quantity, the lower the price.